We fired up our irrigation system at the same time we began our greens aeration to knock the sand down and to water in our fertilizer applications. We developed a couple of leaks in our system which required repair. Our system is 4 years old and for the most part is operating perfectly but from time to time there is some type of failure. There are many T's required in our system. Most T's used in golf operations were plastic but facilities over the last 10-20 years have been using on a more frequent basis Ductile Iron fittings. These fittings are superior in their strength and lack of failures(cracking) never occurs which are fairly common in PVC piping. The metal fittings have a rubber gasket at each exit that the pipe slips into and keeps it secure. The failures that we have seen in the last few days appear to have occurred from the fittings sinking which allows the pipe to blow out. Concrete or thrust blocks are put in place to reduce the potential for pipes to move but sometimes this can still occur which is what we believed happened over the last couple of weeks. This is probably some of the most difficult work our staff has to complete during a day. Usually the soil is wet from the leak, they are trying to disturb as little area as possible, its a couple of feet deep in the ground and you have to dig carefully because of the wiring that runs along the route of the piping. But it is all in a day's work for our staff. Asst. 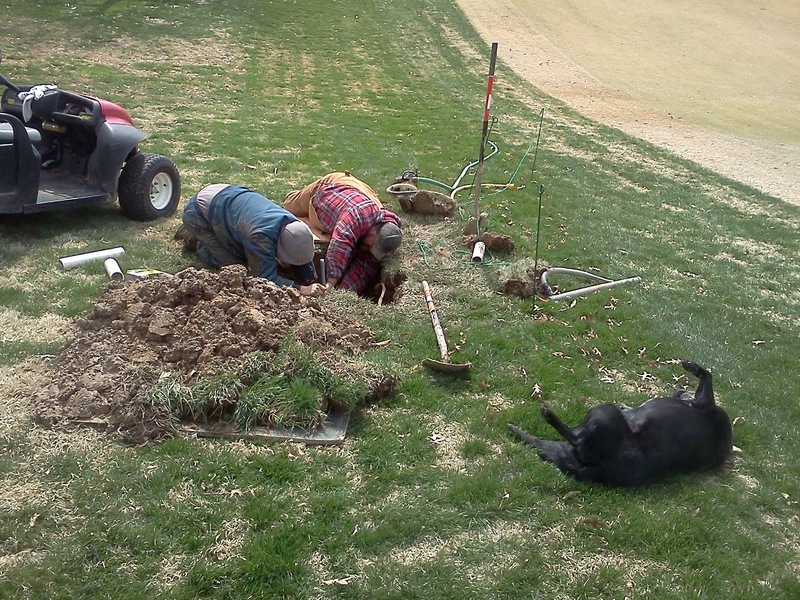 Skip and Russell working on our blow out next to #11 fairway with Lady keeping a close eye on the guys. Russ and Jason working behind the Sassafras tree near tee #2. Well, with Friday/Saturday totals of 4.9" of snow, this season zoomed into 7th place all-time snowiest. 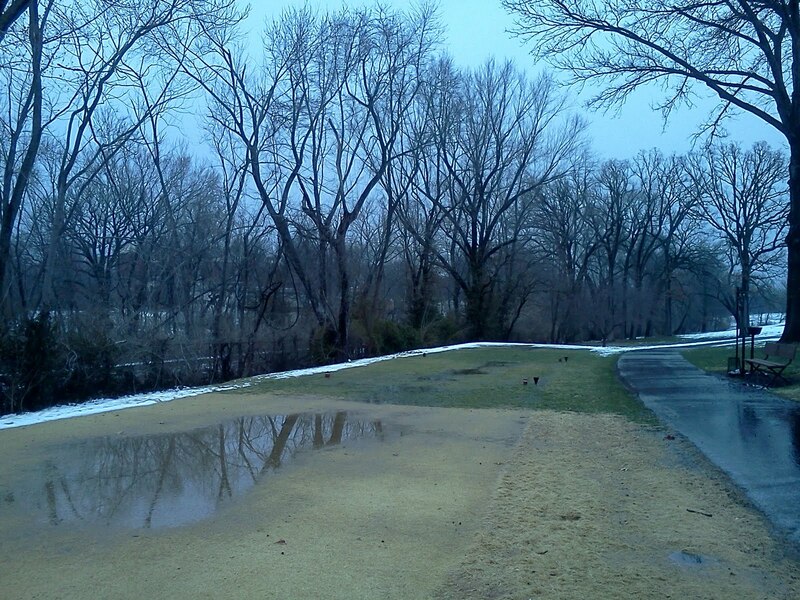 Hopefully, we will not receive another 3.9" tomorrow to move us up another spot in the rankings. Drug the greens today and got a mow in finally and bunkers were raked. Greens are continueing to heal from the aeration. Warmer weather to come later this week. It appears we are heading for a top ten all time snowfall total for the winter of 2010-11. 31.8" so far this year with I assume another 1" or more to report from today. Weekend does not look good for golfling conditions as well. I know its going to turn around soon! 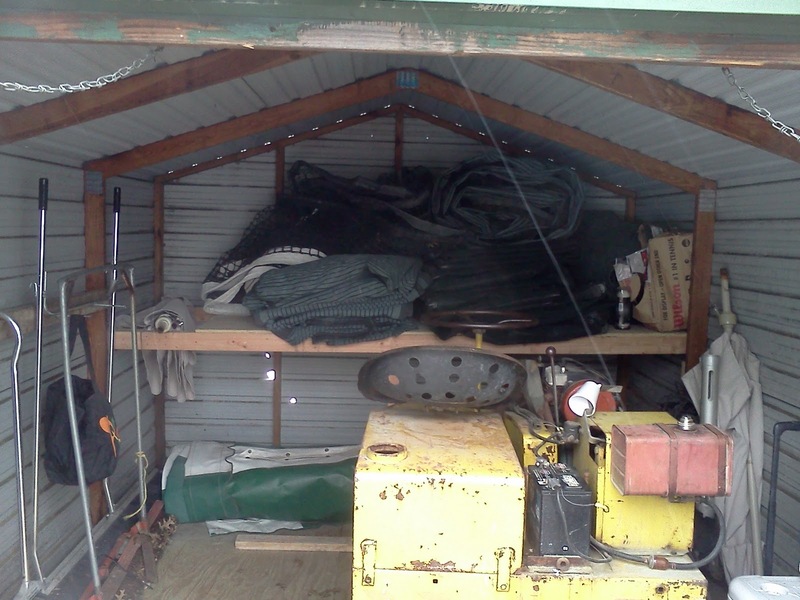 The storage shed at the tennis courts has been in need of some repair. The floor was caving in and there were no shelves inside to store supplies. Assistant Skip and Russ worked the last couple of days to make repairs and they look great. Floor reinforced to help hold up the roller and other supplies. New 3/4" plywood floor capped off. Russ and Skip putting up brackets for the new shelving. 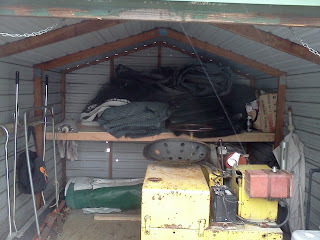 Shed cleaned out and everything put back in place. Ready for the tennis season! Yesterday, we began the process to core aerate our rough. 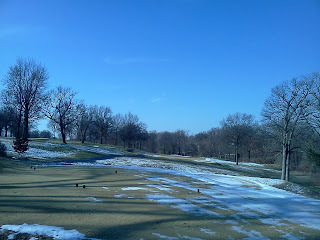 We were able to aerate the rough in the fall as well. 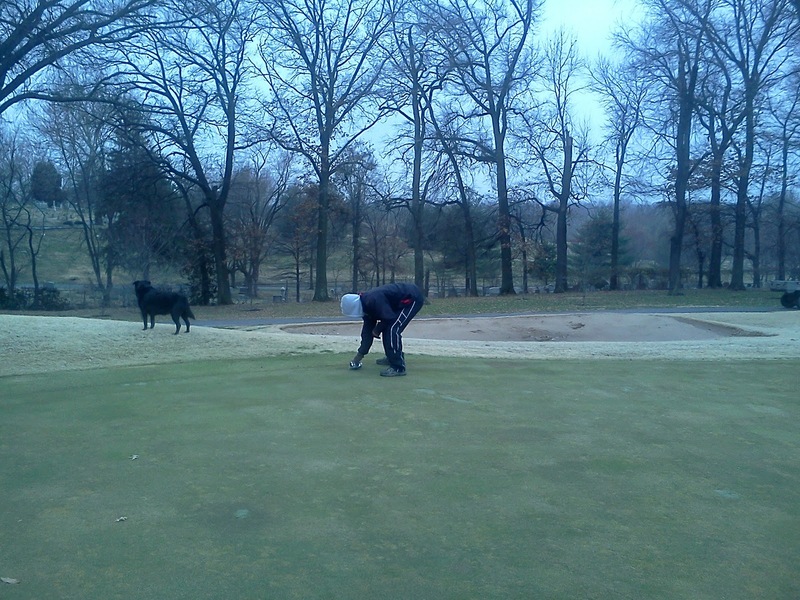 The staff concentrated on the cool season green surrounds yesterday. As weather permits over the next few weeks, we intend to aerate our main rough areas pulling a 2-3" plug. This aeration process will help us reduce some compaction in high traffic areas, will improve soil oxygen content and reduce runoff of water by providing tiny reservoir's where the plug was removed which allows water to penetrate into the profile more quickly. We plan to pull a weighted drag with a cart over the plugs to break them up to reduce the healing time and mess that wet plugs can create. 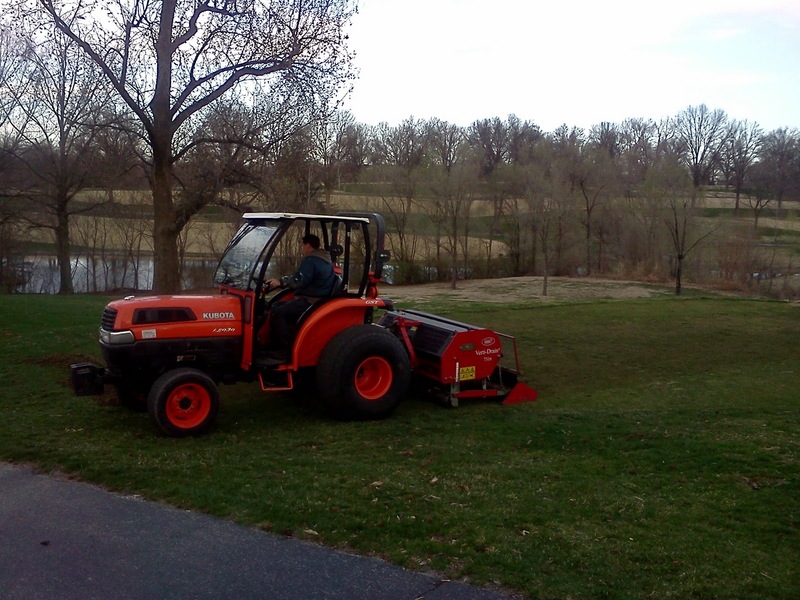 Tom pulling our rough aerator around #12 green. The back view of the aerator. 8 tines with 12 total wheels(6 feet wide) and blocks on top of the machine to increase the depth of the plug. A plug that is about 2" long. Our 3rd green sustained some damage from an overheated radiator during our aeration. 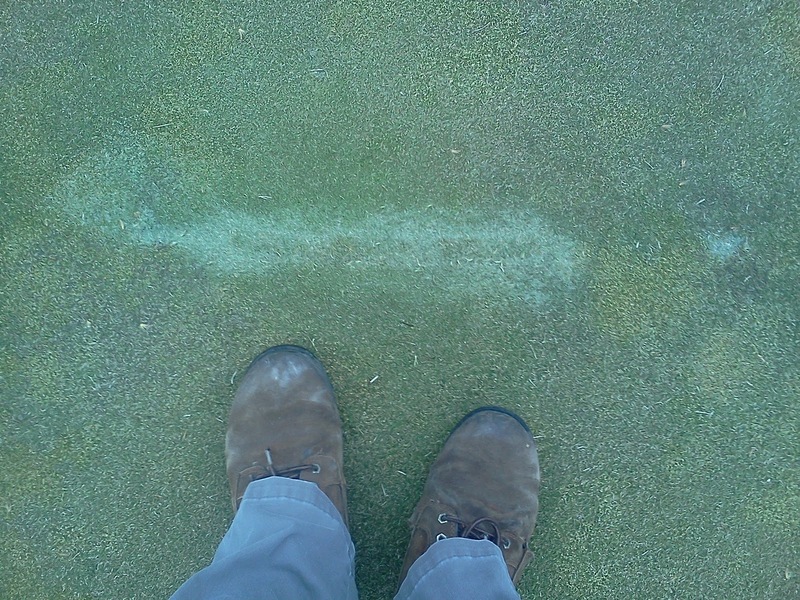 A line about an 1" in average was burned across the green. A belt broke controlling the fan which allowed the unit to overheat, By the time the operator was notified of the overheating from a warming light, he had already tracked across the green once and proceeded across it a second time. The turf was burned from the heat but appears to be green in the crown area of the plant. We will continue to monitor this situation and will replace any area of turf that does not survive. The line is not as pronounced in the picture. If you've played the course over the last couple of weeks, you have seen poa annua in various stages of death in our fairways and tees. There is one fairway, #7 that did not get sprayed with our RoundUp/Preemergent application due to some conflicts with the weather. #7, especially at the beginning has a large crop of poa that has recently increased in size due to the warmer weather. I just got out and sprayed it today with another product that is safe to spray as the turf comes out of dormancy. You should see the effects of this material on the poa over the next 2-3 weeks. 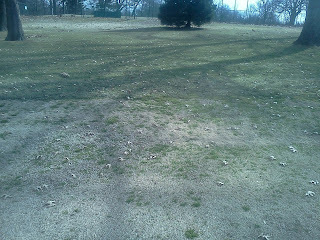 Large spots of poa annua at the beginning of 7 fairway that will soon be turning yellow and dying. Some great days for the beginning of spring but some cool weather to come over the next week. Hopefully not too far below 40 because our Saucer Magnolias are in full bloom by the main road. In the Echo Brief yesterday, you were introduced to our new horticulturist, Becky Edwards. I believe Becky will be an outstanding addition to our program here at Glen Echo. I've already ordered plants in for the season so Becky is a little stuck with what I purchased(But I think I picked some pretty good plants). She will be supplementing our purchases with some additional material that she needs for the season. Special attention will be placed around the clubhouse to improve some tired areas. We are currently evaluating a number of areas for improvement and updating. In not neglecting the course planting beds, I've asked her to focus on the tee side of #9 to improve that once fully flowered area all the way to the red tee. Our planters will be an area of focus as well that I have asked her to address. No doubt that some improvement is needed. I already started this with some early season color from pansies, cyclamen, viola, and a couple of other plants. Becky helped finish off the rest of the planters on her first couple of days on site. We worked tirelessly over the last couple of years to bring you a good ornamental program but time on the course took away from our efforts as well as some knowledge gap. Now, with a trained person like Becky to focus on this area 100% of the time, I believe this program will be drastically improved. I will bring Becky into the ladies luncheon for a quick introduction. She will also be making a regular appearance on the blog to discuss our program, talk about plant material and give some tips for your home landscapes. As many of you know from your home lawns, leaf season is not over here at Glen Echo as well with well over 1,000 trees inside the fence lines of our beautiful 18 holes. The guys are working the fence lines today in an effort to gather up some of the leaves that have scurried there through the many wind gusts over the winter. Trying to get some of this busy work done before the grass begins to grow everywhere. Tom, Arian, Nick and Jeff are blowing leaves away from the fences and are then vacuuming them up with our sweeper. Multiple loads have already been hauled back to our dump area with many more to come. Arian and Jeff along #4 blowing the leaves out of the fence line. Nick knocks the piles of leaves over with the Sidewinder mower and Tom would pick them up with the leaf vacuum. Smooth the teeing ground surface. Improved root health with a mixture of sand and soil allowing for more oxygen to penetrate into the profile. . Protect the crowns of the plant with sand. The surface of the tee will drain quicker with a layer of sand on top and sand channels for the water to penetrate into the profile of the tee. Easier to place a tee in the ground through a layer of sand than soil. Russell on #14 tee. Screen drag on the back of the aerator which pulls the cores to the end of the tee for easy clean up. Cores waiting for Tom to pick them up and haul away. Our yearly greens core aeration program was just completed over the past two days. Ten staff members working well over 150 hours to complete this task. We still have some clean up along the edges and approaches of greens to remove some of the excess sand. Our depth of aeration was set at 4-4 1/2" which placed the aeration into the soil layer of our push up greens. The USGA has a great animation video discussing why we aerate greens. Our program over the season will include multiple venting of greens on a monthly basis with a 1/4 tine. This process is very limited in its surface disruption. In most cases, you will not see it the next day. We will also contract out the water injection aeration program at least one time during the heat of the season and will conclude our aeration program in the fall with a solid needle tined operation in late October. Russ Klevorn operationg the Verti-drain 7316 deep tined aerator on Monday/Tuesday. 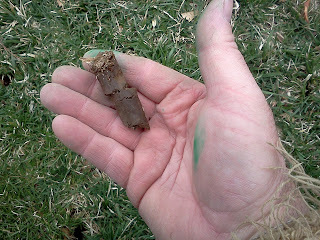 We were using a 1/2" coring tine. The trail of aeration plugs left on the green. On the far right side you can see the core harvester which picks up the plugs as they are pulled out of the green. Mechanic Harry and Jeff working the core harvester. Normally the machine does not drive on the plugs first but on this green the angle required the machine to drive on the inside for the first pass. The rest of the time we operate without smashing the plugs into the green surface. Once the surface was clean of plugs, we placed a soil/sand amendment application on the green which helps to provide some supplemental nutrients to the sand layer. Assistand Skip topdressed/buried the greens with sand to help fill up all of the holes. We placed about 5200 pounds of sand on each green. Not pictured is Nick with the drag brush operation. Once they were dragged in 3-4 different directions, Jason used our portable blower to help move the sand into the holes to completion Some excess sand then had to be removed from the green. One last dragging to smooth the surface. 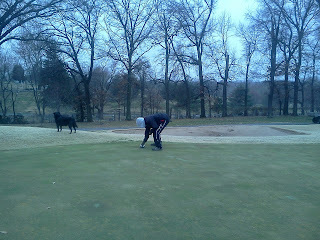 Tom and Arian rolled the green to help smooth down the holes. Normally we would mow the greens last but there was not much turf that needed to be trimmed. Our first mowing was completed today. 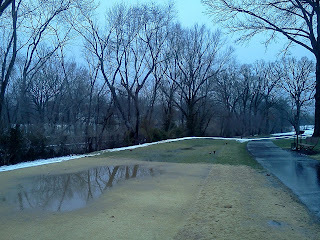 The greens were then fertilized and watered a couple of times to water in the fertilizer plus help settle the sand. The staff have been going around cleaning the edges with blowers to remove the heavy application of sand away from the warm season grass and the edge between the green collars and rough/fairway height turf. As long as we do not get too much rain over the weekend, our greens core aeration is scheduled for this Monday and if the weather holds off will be completed on Tuesday. The forecast for Tuesday does not look promising. I will keep you informed through the blog and or an email blast of the progress. I will go through a more detailed discussion regarding the work and its benefit for our greens next week. Early season aerification takes slightly longer to complete due to our greens being wetter and air temperatures cooler. I want to get them completed as soon as possible so you can enjoy your beautiful course as the weather improves in early to mid-April. 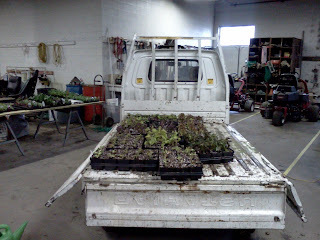 Our new plant material is arriving for the season. This week, we received our first of three shipments over consecutive weeks. 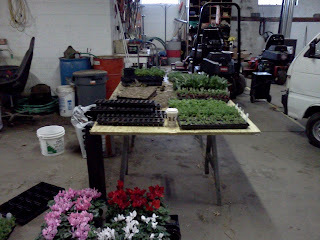 Time to start potting and placing the new plants in the greenhouse. We have about 4200 plants this season which is down by about 1/3 from last year. Most of our material will be grown in 4" pots with 15 plants per tray. Larger plants call for more spacing between plants and less overall material. Last season over 1/2 of our material was grown in with 36 plants in atray. We will be purchasing some additional materials locally to round out our program. We are in the process of hiring a seasonal horticulturist to take over the day to day activities of our landscape program. Our horticulture program has worked without a trained person since the late spring of 2008. During some very difficult times for our club, we stepped up and provided some nice work in our landscape areas but there is some definite improvement that needs to be made to our ornamental program. I'm looking forward to the assistance and improvements that a horticulturist will bring to our beautiful clubhouse, surrounding grounds and golf course. I will have an announcement early in the week once our new person is in place. New plants placed in pots and waiting to be moved to the greenhouse. Potting table with some blooming Cyclamen on the floor which will be placed in planters around the clubhouse for some early season color. It's that time of year, these little varmints are harassing not only our staff at the golf course but in our home lawns as well. I've attached a video from Caddyshack that you might enjoy watching. I know this is no laughing matter when it comes to the destruction that they create in finely manicured turf and ornamental plants. I've attached some information from The University of Missouri regarding the various species and control measures that can be used to protect your property from damage. Most of the damage that we experience at Glen Echo comes from the outer edges, cemetery, ditch lines and etc where they have free rein to move in and out of our property. Most people believe that if you have moles, you have grubs. That could be the case but 95% of a moles diet consists of earthworms. If they see a grub, they will chomp it but they gorge themselves on earthworms that are much more plentiful in the soil. We have a number of areas on the property that we will be working on to control our population this spring. The Roundup that we sprayed on our dormant fairways/intermediate rough, warm season green surrounds and tees is working. Yellow plants all over the property. There a few plants of bluegrass, rye and fescue that will probably not die from our application due to the rate being too high for safe application on dormant zoysia. In those cases, we can carefully spot spray with another product over the next few weeks. 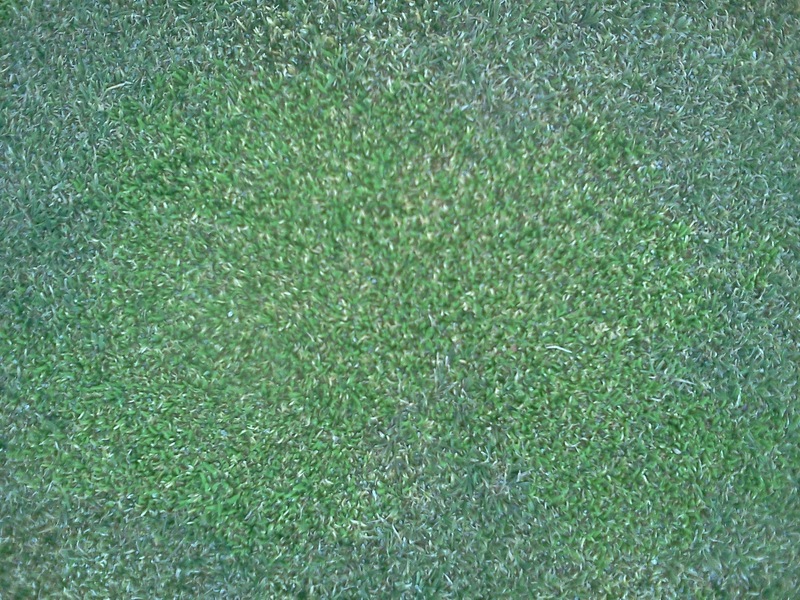 Poa annua right after application about 3 weeks ago. Green and healthy. 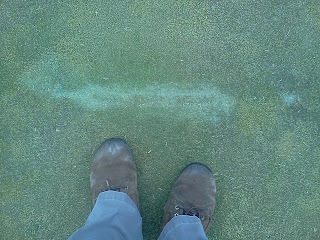 Poa annua 3 weeks later is yellow, chlorotic and dying. 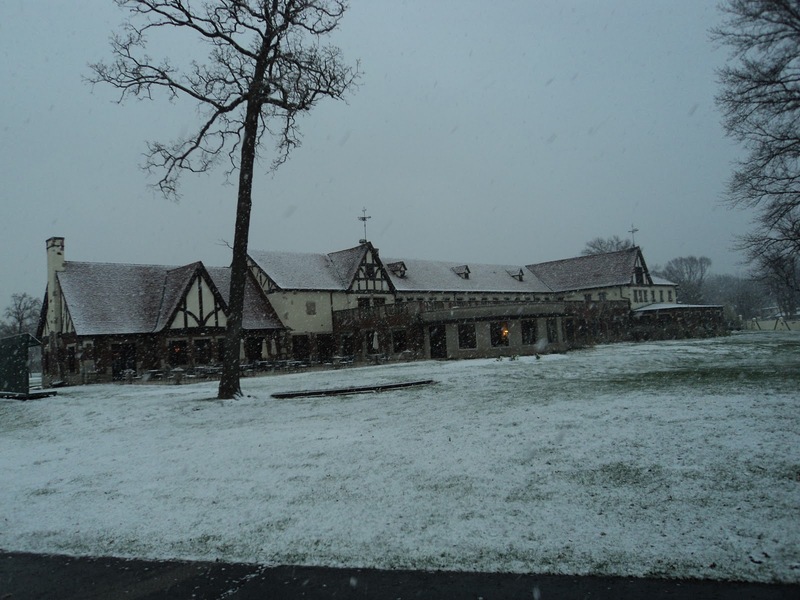 Course will reopen on Thursday, 3/17. I know this is not news regarding Glen Echo but I have a peer, Keith Pegg who works at Zama Golf Club in Zama Japan which is only a couple of hundred miles from the center of the damage. Keith is from Washington State but has worked in Southeast Asia for over 20 years. I sat with Keith a few years ago at an evening get together at our annual conference and had an interesting conversation with him. He posts regularly on a Golf information network(TurfNet) that I belong to where we exchange a great deal of ideas and thoughts about the golf industry and our work. Keith has worked in Japan, China and other places throughout southeast Asia. Here are some of his excerpts from his experiences over the last week or so. Keith Pegg from Zama Golf Club in Zama, Japan. Posted 3/11/11 3:28 p.m. It has been a ride, I am okay about 200 miles south but was almost knocked down from first blow. No phones that work but Internet is okay at times. Many towns are gone and all the people in them. It is 5 AM and we just had a shake and we headed outside again. My home is okay with just a few cracks, My Course is okay so far and my staff some live on the coast so I am very worried about them. Just went into work (my day off) and every thing is okay even the irrigation system no major leaks. 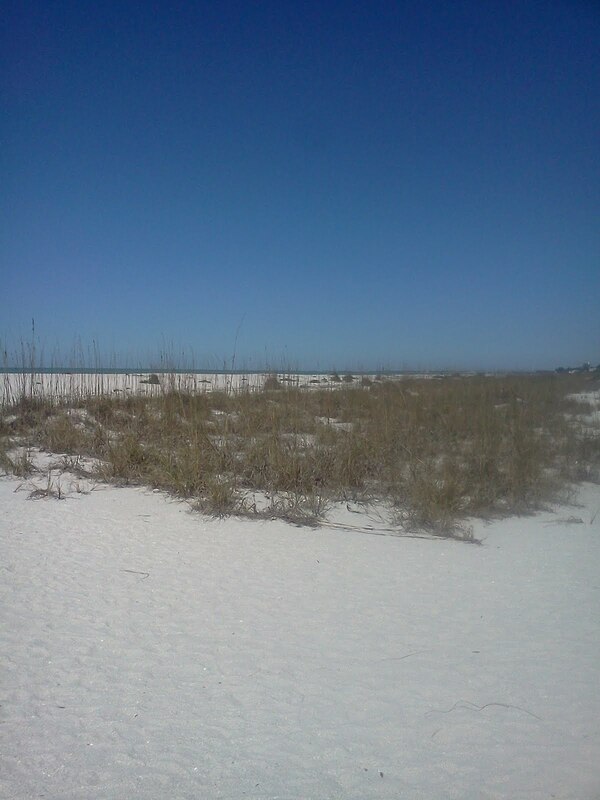 My staff is safe even the ones that lived on the coast they have moved inland and hope there homes are okay. Golfers were coming out so I guess the world still turns. A few years ago after I lost some friends in SE Asia I put together my kit to Survive, I keep this in My apartment ready at all times. The food changes as I eat it and put in new but the amount is always about the same. I have a backpack and a carry-on air case ready. I also have papers, passport and money. I keep my car always with 1/2 tank plus to full at all times. In My apartment I keep 20 gal of water also. Takes very little room and cost was not much. I use the food so that is always new. My apartment is only 300 sq ft so it has to be a small kit. * Long shelf life foods that equal 70 to 75 meals 1,200 cal per day high energy bars could replace most all food items and take up less space 400 cal per bar. (Remember to update before expiration date). *Two pairs of Latex, or other sterile gloves (if you are allergic to Latex). Eye wash solution to flush the eyes or as general decontaminent. * Some lights have radio, hand crank, phone charger and solar charger. 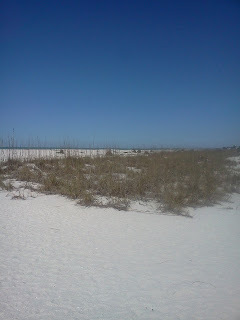 Needs to be private yet close to a home or starting point, may change if on a trip or vacation. Remember even on the road a meeting is point needed. Someday soon I will come back to the USA and my home in the Olympic Mts. of Washington and will have kit better and bigger I am sure. Because weapons are not included here they could be an addition to any kit. New Quake last night at 10:30 a 6.2 but very close and I was holding on, as my home went up and down. Not near as bad as the 8.9 last week but that was 100 miles away and this was in my area. Gas problems with long lines, trains are maybe staring again this weekend if all the tracks are fine. Rolling blackouts two 3+ hour times a day for most of Japan. Food is short supply with milk, eggs and bread gone. Batteries, flashlights, candles were all gone the first day. All water has to be boiled and I also have iodine drops to add to mine. The Nuclear Reactors are far away from me about 50 miles is the closest. They have been testing air, soil and water every hour and so far seen none at my location. About 10% of our X-pats have left and maybe 40% with small children have seen them getting out and the husband or wife may stay and keep working. Planes are coming and going now on time for the most part. Very few people coming in but they are full getting out. One of my staff is on his way as a Reservist with the Army of Japan; he will grow up a lot these next few weeks. One other man on my staff has his Mother and Father up north and they are in a shelter, hose gone and lucky to be alive. They went 4 days without any food and almost no water. A story I am hearing a lot these days. We hope they will have a truck road to the north soon and they can then bus the people out. Talked to a man last night that had walked 3 days and 50 miles before getting a bus back here. Many people we will not hear from I know but keep hoping. The rest is on your news and it is better coverage than I am getting I am sure. 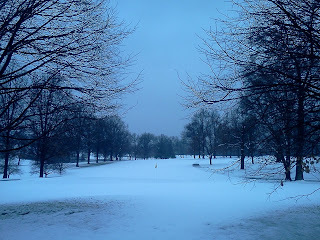 1.25" of rain yesterday plus 3" of heavy wet snow. Another .35" of rain overnight. 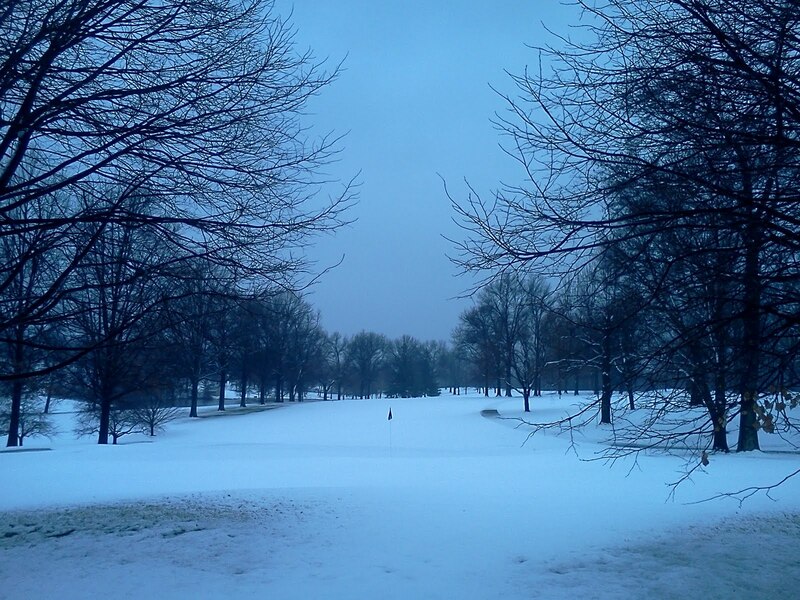 3.61" of rain and 3" of snow since March 1st. We are at the average amount for the month with 15 days to go. Well, you know I have to take the blame for this latest snowfall. I told Harry to take the snow plow and frame off of the tractor last week. Hedged my plan a bit when Harry said it would not take much time to put it all back together again. Oh well, 70° by Thursday and St. Patty's Tourney on Saturday. See you then. As spring arrives, time for an update on our bermuda eradication program. Google earth has updated their current﻿ maps to 4/9/2010. This view of our course is great because it has captured our early season application of our bermuda eradication product mix. Holes # 4, 7, 8, and 13 are receiving regular treatments and I did some spot applications on some other fairways. Its interesting to see the reduction in contamination and how much bermuda is on our fairways so you can get an better understanding of what we are trying to eliminate. We will do some spot spraying on the four fairways we have been working with in April upon green up and will spot spray one or two other fairways. Last season, we had spots all over the course which took a considerable amount of time to go away. 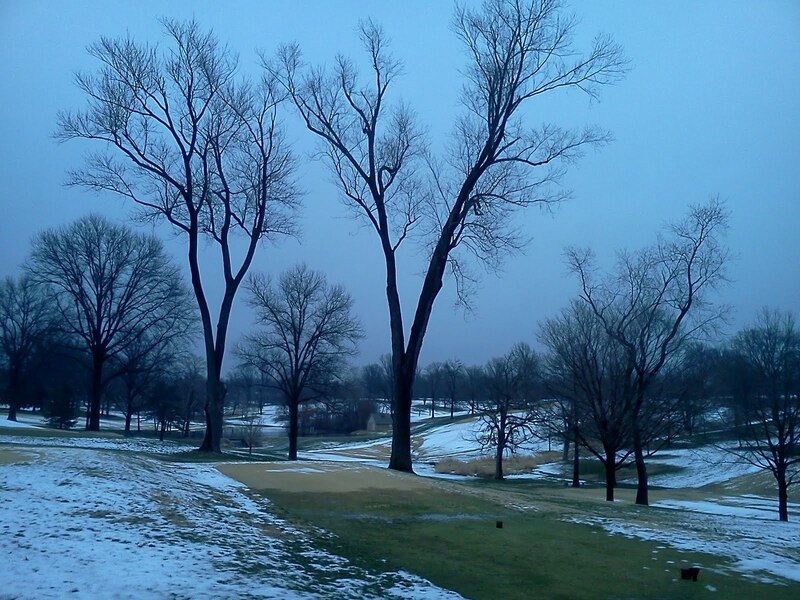 This season, we will pick a couple of fairways other than the main four fairways. This will limit the areas that are disrupted so that members, guests, and tournament players will realize that not all of the fairways are damaged or have issues. We normally make multiple applications during the season to our fairways but the heat from last summer placed too much stress on our greens which told me to call off killing anything else that was green in color. Take a look at the satellite photos below to see how the program is working. Click on the picture to enlarge. The staff have spent the last couple of days repairing some of the heat stress and vandalism damage that occurred late last season. Plugging and topdressing some of the blemishes and areas that were large enough to utilize some plugs from the edge of the green. Normally, we take plugs from our nursery but it was reseeded this past fall and is not ready to be used at this time. The plugs will allow some of these areas to speed up their recovery. The sand will smooth some of these spots and protect the grass plants that are trying to regenerate into some of the voided areas. Bentgrass's growth habit is up and out sending new stolons out the side of the plant which allows it to spread laterally somewhat. The topdressing sand will protect the edges of the new tissue from exposure to extreme environmental conditions over the next month or two such as cold, heat, wind and moisture or lack thereof. Tom filling in some of the areas where plugs were utilized for repair. Lady checking out the action as well, looking for a varmint. Repair to the 3rd green with some small turf plugs and green sand to repair vandalism from carts late last fall. We utilized some 4" regular sized hole plugs as well to fill in some of the areas from last summer's damage. Asst. 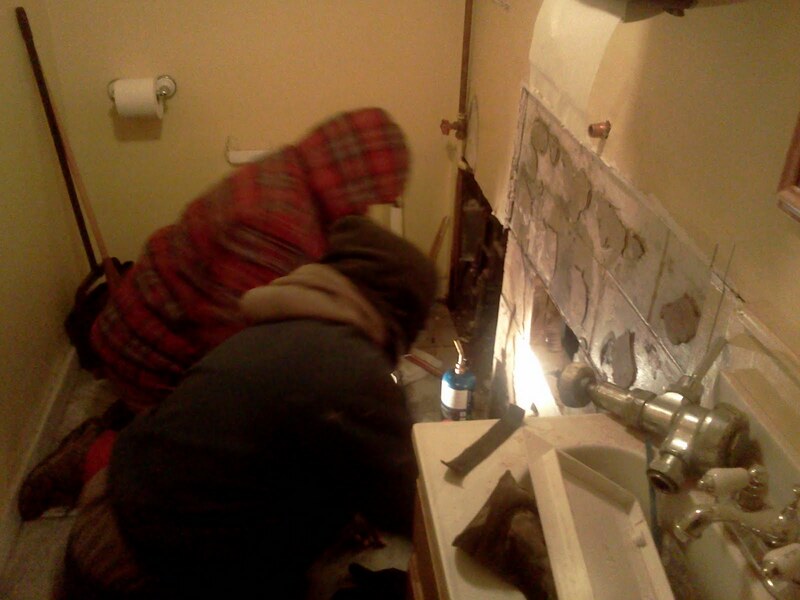 Skip and Russ were getting the water on at the Field Bar to get the restrooms open when they ran into a couple of water leaks. Making repairs to the pipes and will have to make some wall repairs. It's not all about turf in a day's work for our staff. Utilizing a new Smartphone and trying to figure out some issues I'm having trying to post from a mobile device. Fellow supt helped me with the email set up of posting a photo and blog post while using the mobile, still having issues with posting through the internet on my phone. Probably a browser issue. Keyboard does not open up when I'm trying to type information into the body of my post. Useful to use when out in the field and not near a comptur to make a quick post or when I am off site and do not have a computer readily available. We will keep you informed. Sending blog post from phone through email. I missed the actual Anniversary date of the first posting to our course blog, February 23, 2009. My stat counter since November 2009 has counted 11,934 unique visitors with over 21,000 page loads. 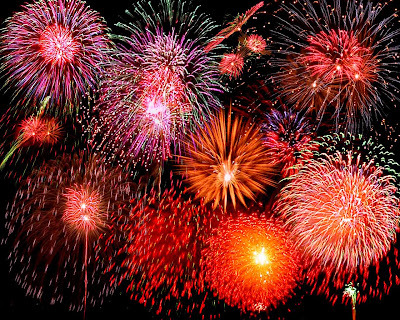 Countries with more than 100 views have included US, Canada, United Kingdom, Germany, Russia, Netherlands, Ireland, Australia, South Korea and Latvia. Its been a lot of work but it is always worth it when our members comment about seeing something on the blog or expressing their appreciation in keeping them informed of what is taking place on their golf course. Join me regularly to see what new things we can explore over the next year of The Glen Echo Country Club Golf Maintenance Blog! On Monday, we had a contractor remove a couple of dangerous, dead trees along the power line/fenceline next to the range on St. Mary's lane. 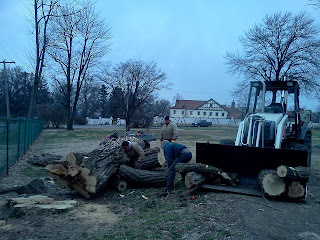 They finished their day with some additional pruning of some dead limbs on a couple of trees as well. Our staff, removed the debris and finished the clean up process. Locust along the street that was hollow and damaged. Russ, Tom, Jason and Nick who is not pictured are removing the debris. 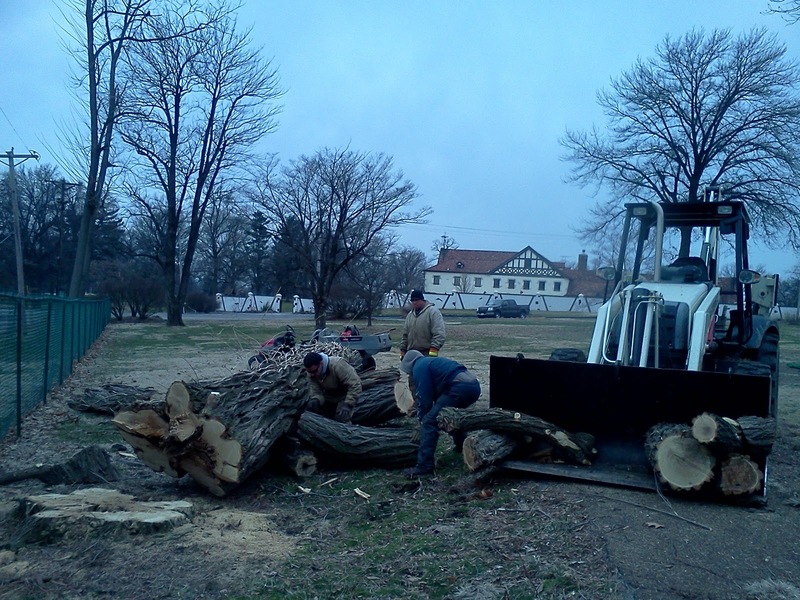 Contactors trimming dead limbs from oak on #1 tee. They also dropped the two damaged trees along St. Mary's lane. ﻿﻿ One of our more important programs for spring golf in our area is an application of growth regulators to reduce the effects that tiny poa annua seedheads have on ball roll and smoothness of our greens. Verticutting which stand up the seedhead allowing the seedhead to be cut off completly. Additional growth regulators which keep the poa plant weakened and shortened. What is a growing degree day? The high and low temperatures of the day are added together and are then divided by 2 to get the average temperature for the day. I.E., our weather station reported a high of 67 and a low of 52 which is a total of 122. Divide 122 by 2 and you get 61(Average temperature for the day). Subtract 32 from 61 and you get 29 degree days. The degree day count in our area usually begins between mid-February to the 1st of March. 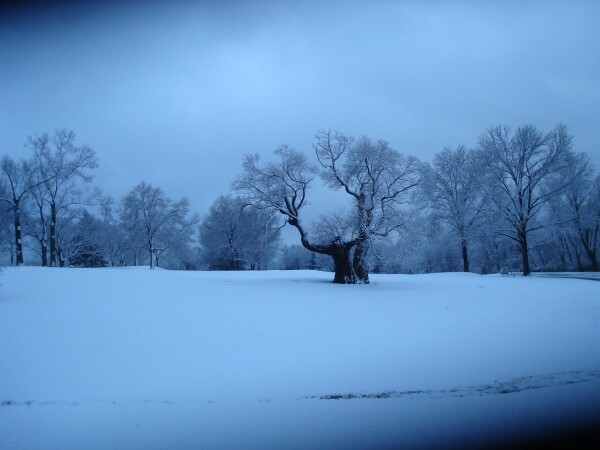 Over the years, scientists have looked at how temperatures trigger pests to begin their process which create havoc on turfgrass. This can include egg laying of insects to seedheads forming on poa annua to disease models for spraying early season preventative applications of summer root diseases. Ohio State University has an informative explanation on the growing degree day model as well. 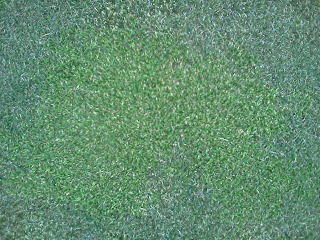 A current picture of poa annua on our practice green without seedheads. The end of February/early March is the time for our staff to begin some early spring clean up of our ornamental plantings. 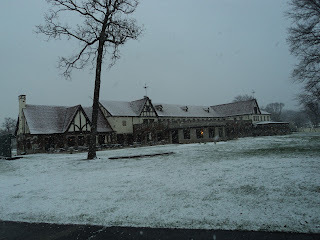 Our initial focus is to begin removal of the dormant ornamental grasses that we allowed to flourish in the winter to provide contrast in our rather stark winter landscape. Russ, Jason, Tom, Randy and myself have been removing grasses and raking leaves that always seem to gather around the bottom of clumps of dormant grass. Ornamental beds that were not trimmed and cleaned before winter will be cleaned over the next few weeks before the new spring growth takes over. Some plants will be divided, removed and or new plants will be incorporated to improve the look of some of our beds. Pre-emergent, fertilizer, and new mulch will be added for weed control, energy and moisture retention. This season, I will be hiring a seasonal(April-October) horticulturist to assist our operation in managing the many ornamental beds/planters around our grounds and golf course. I enjoy the ornamental part of a golf course but do not have the time to devote to the type of study and education required for the turf and ornamental areas on our great property. I hope to begin interviews in the next few days and will have someone in place by the first of April. Within the next 10-12 days, new plants will be arriving to start their life in our greenhouse and then be transferred to our various planting beds. Jason and Tom removing dormant ornamental grass from the irrigation lake spillway. Anyone who came out and played over the last couple of days has seen some marker dye being used around our greens, fairways and tees. I was completing the preemergent/roundup application in our warm season turf areas which controls in season goosegrass and crabgrass germination and will kill the poa annua that pops up in places. The staff used a 4x8 sheet of wood to drag around the edge of the collars to protect our green/collar turf from any over spray as we drove around the collars. We might have some small hand applications to spot treat over the next few days due to bunkers being too close to the green surface or the sprayer moved a little further out then planned. 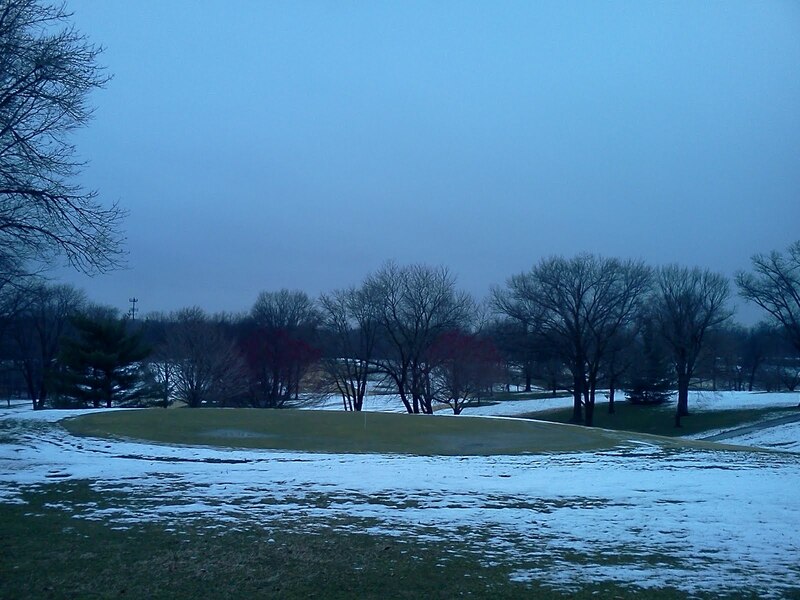 We will be applying preemergent and weed killer to our cool season first cut rough toward the end of March/early April. Green #16 complex and the marker dye which indicates to the operator where the plant protectant materials have been applied. Daily Temperature/Average temperature/Deviation from Average either plus or minus. The weather outlook maps for the next three months from the National Weather Service are posted below. We are in the EC area of the maps which is near normal(whatever normal is) in both temperature and rainfall expectation.